조선 후기에 제작된 전국 군현 지도첩으로, 채색필사본이다. 전라도를 제외한 7개 도의 군현 지도를 모은 것으로, 모두 7책으로 구성되어 있다. 제1책에 함경도(23장), 제2책에 평안도(42장), 제3책에 강원도(27장), 제4책에 황해도(23장), 제5책에 경기도(33장), 제6책에 충청도(54장), 제7책에 경상도(71장)의 군현 지도가 수록되어 있다. 1개 군현이 1개 도엽으로 그려져 있으며, 일부 도엽에 비변사 도장이 찍혀 있다. 본 지도첩의 모든 군현 지도들은 20리 방안(방안의 1변 길이가 4.2cm) 위에 그려져 있다. 이 방안은 축척의 역할을 하기 때문에 본 지도첩은 전국의 모든 군현들이 동일한 축척으로 그려져 있는, 보기 드문 지도첩이다. 또, 군현의 모습이나 지리 정보의 위치 역시 전통시대 지도 중에서 가장 정확하다. 우리나라 지도 발달사를 뚜렷이 보여주는 관찬 지도로, 학술적·역사적 가치가 높다. Compiled in seven volumes, these are calibrated maps of counties (gun and hyeon in Korean) across Korea during the Joseon Dynasty, each grid section equaling 20 ri square (1 ri approximately equals 400 meters) and each leaf depicting one county. The maps have lines of longitude and latitude but no numbers. Some leaves have the stamp of the Border Defense Council. 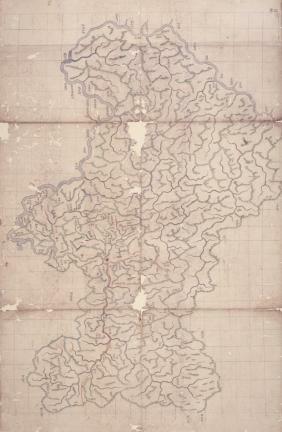 With the system of dispatching representatives to all of the eight provinces fully implemented, the council began producing large scale maps, with each grid section covering 1 ri, for use in regional governance. But the maps showed limits in achieving uniform scale. The council resolved the irregularity found in earlier county maps by devising 20-ri grids and using unified cartographic signs. In this regard, these maps represent an important phase in the history of mapmaking in Korea.